The Z was born of Yamaha' s long and close partnership with the legendary trumpeter Bobby Shew. Bobby is an incredibly versatile player, and to meet all his playing requirements he wanted to create one super efficient instrument which could scream out a powerful lead, or play soft, mellow ballades. He finally found that instrument in the Z. When we decided to try to improve the Z, trumpet designer Shunichi Niwata and R&D specialist Bob Malone worked together with Bobby, passing into it all the special techniques we'd learned since designing the first Z. And the results speak for themselves. Yamaha professional lightweight trumpets have a one-piece bell for exceptional tone and response. Hand-lapped valves and slides provide precise fit and smooth airflow. The main outer tuning slide is unbraced for comfortable open playing and less resistance. Excellent intonation and response are assured by the one-piece drawn gold brass leadpipe. Features: Monel pistons: Monel pistons are resistant to corrosion and are an ideal choice for professional trumpet pistons which must retain precise fit and smooth action over many years. Unique Bell Bead Design: This design allows for a more resonant and projecting sound. Hammered one-piece bell: The newly designed yellow brass bell features a side seam and a variable wall thickness. This new manufacturing process results in a quicker response, a deeper rich sound, a wider spectrum of tone colors and better projection. Hand lapped pistons and slides: Hand-lapping pistons and slides ensures an absolutely perfect fit and seal between the pistons and casing or slide parts. Such a perfect fit helps to achieve smooth air flow and smooth action and improves the response and intonation of the instrument. Laser-fused pluzuma welded bell: A high-energy laser fuses the brass together for a virtually seamless bell which allows continuous even vibrations. 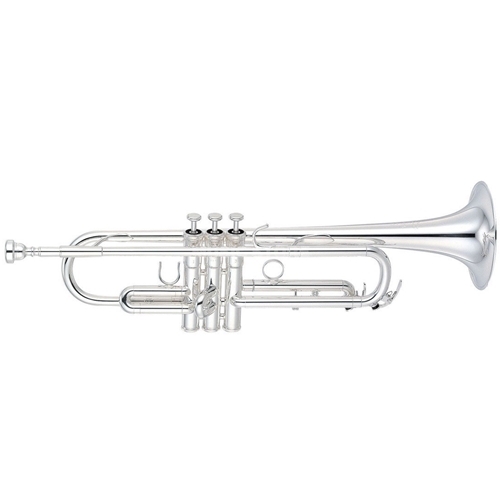 Unbraced reversed tuning slide: As with all Yamaha lightweight trumpets, the YTR-8310Z has an unbraced inner outer tuning slide which makes the trumpet comfortably open with less resistance. One-piece, drawn, gold brass leadpipe: This type of leadpipe offers excellent intonation, response and proper resistance. Large bell flare and large bore tuning slide: The large bore tuning slide and large bell flare in combination with the stepped bore design allows this medium bore trumpet to produce a very big sound with very little effort.